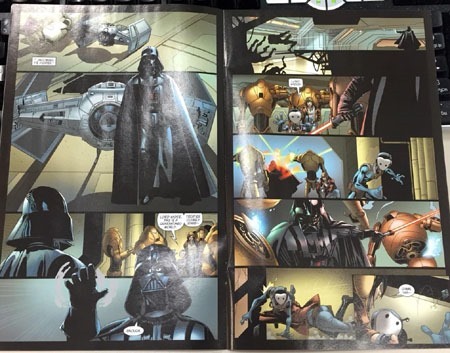 I’d picked up the first several issues of the new Marvel Star Wars and Darth Vader comics, and while I enjoyed them “well enough,” the “new & shiny” has worn off and I’m back to the fact the things are $3.99 and not feeling as “worth it” to me. (the rapid expansion of the “line” is a contributing factor as well). 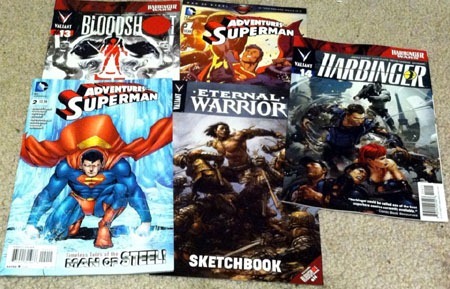 I recently caught up on some of my reading and quickly realized how FAST I was blowing through the issues. I flipped back through and realized how there was a definite LACK OF words on many pages. I love the art, and the fact it has a nicely “cinematic” look is certainly appealing–VISUALLY–but AS it does a great job, I can see it, appreciate it, but I blow right through, taking stuff in like quick single frames of a movie. I don’t even notice much in the way of “visual sound effects” (possibly the tradeoff for not “covering up” the art) so there’s even less to slow the eye from passing quickly over stuff, taking it in and continuing on; seeing and ‘hearing’ stuff in the back of the mind. 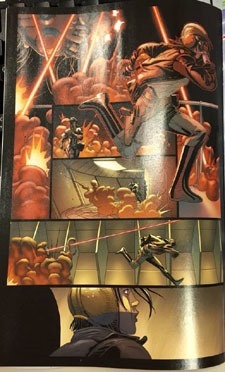 Granted, for the purposes of this post I’m only providing photos of some of the pages-other pages do have a lot more in the way of dialogue/word balloons–but the fact that so many of the pages go so quick is highly problematic for me as we ONLY get 20 pages of story for the $3.99 cover price. 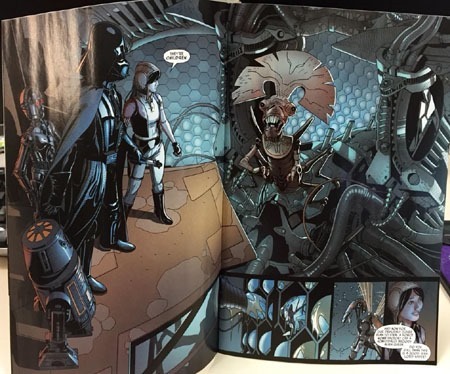 While I certainly like and enjoy good art in comics–for me, bad art can taint a story, but good art merely adds to a story. 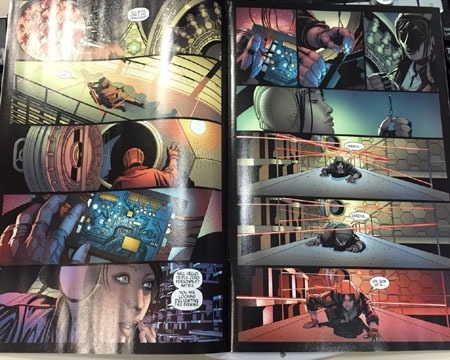 I buy comics for the story…without a story that interests me, I don’t care how beautiful the art “in general” is. Particularly when I re-read comics from the ’90s and earlier I notice just how “wordy” they seem compared to a lot of modern comics. Caption boxes, plenty of dialogue, even some labels and occasional editorial notes. Moreso with pre-’90s comics I notice the more consistent “standard” panel layouts where panels seemed primarily contained to boxes…sure, the layouts might not be as dynamic as present-day, but having more distinct panels (in my mind and memory as I type this post) seems to mean “more” panels on a page. Particularly when there’s a lot of quick action in-story, just like I’m not going to hit pause or switch to some half-speed mode watching tv or a movie I don’t feel any need or desire to pause in moving through an issue to look closely at every little detail that might be present or marvel at the sheer quality of the detail, etc. If you’ve read my blog at any length you certainly know that I have a problem with $3.99 as a price point for comics (especially for Marvel and DC, while I’m more lenient on other publishers). Only 20 pages for my $3.99 gets quite annoying; and $3.99 when I can breeze right through an issue in 5-6 minutes would mean I’m paying the equivalent of $40/hr for entertainment. That’d be like spending $60-$80 to watch a movie! I can buy a prose novel–a STORY–for $8 and carry the thing around reading for those 5-10 minutes at a time here and there for WEEKS before finishing it. Not all comics are quite so quick a read (and they are certainly of varying quality)…and as said earlier, I really like the art on these issues; it’s just that I don’t find the art alone to be enough to justify the cost in and of itself. 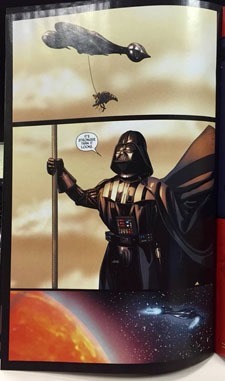 I was already figuring I’d cut my losses and drop the Star Wars books/avoid newer ones–I can pick single issues up later from bargain bins or I can buy the collected volumes or I’ll outright forget ’em and life will simply go on. 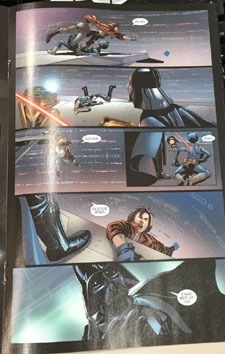 The page count and lack of story PER ISSUE just doesn’t work for me. Usually, I’m not one for buying a tpb the week it comes out, nor for buying it at a shop instead of waiting to get it on Amazon or some other site or finding it at a used book store. But this volume is a bit of a milestone: it begins the collection of Paul Jenkins‘ run on the title–brand-new-to-collected-format material I have been interested in reading for well over a decade! I’ve been trying to keep up with these new editions, and fully intend a serious re-reading project at some point. Until then, though, I add to the shelf, while removing my older editions to make space for these numbered editions. This volume collects 13 issues, and while not the thickEST of the Hellblazer volumes in this new run, it’s still a very nicely-thick book. The best part is that despite that whopping issue-count…the cover price is STILL ONLY $19.99. And truthfully, I felt the need to buy this one in-store because so few volumes carry such a REASONABLE, respectable ratio of price-and-content. I’ve no doubt that a Marvel volume of this size/this many issues would be at MINIMUM $34.99 if not $39.99. Of course, for Marvel, that’d be a “mere” $3/issue contained within as opposed to the seeming “standard” of $4-$5/issue contained. This volume works out to about $1.54/issue…which is LESS THAN COVER PRICE for the individual issues it contains. Truly a benefit of the format, and a large part of what draws me in: the bargain of having en entire story or run of issues in a single volume…at a better price than the single issues. All the more as these issues are from the mid-1990s so nearly 20 years old and (at least in my experience) not the easiest to come by in bargain bins. These new editions are becoming a larger part of my overall Hellblazer library. With many of these replacing 2-3 prior volumes, I’m also liking how the collection is shaping up with the thicker volumes instead of a bunch of skinny little things. 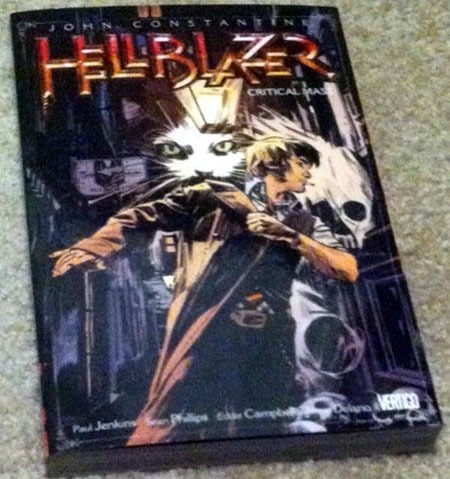 I’d thought this 9th volume wasn’t going to replace anything, but then realized that the first issue of the collection–#84–wraps up the material reprinted in the Hellblazer: Rare Cuts volume. 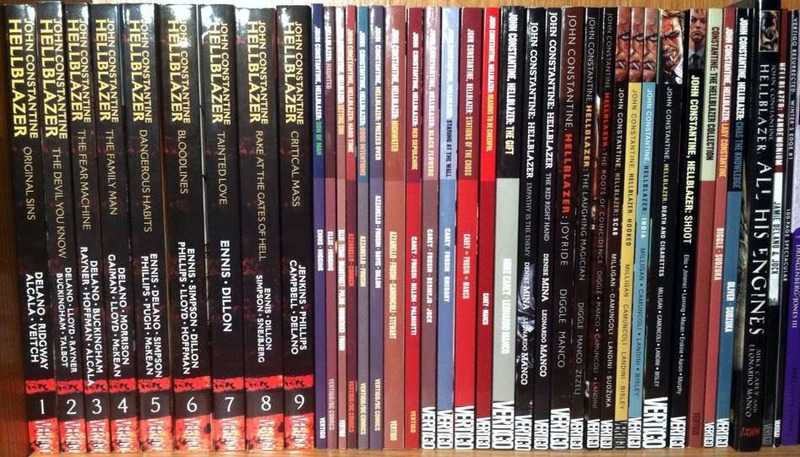 At the time, that volume had stuff that hadn’t previously been reprinted, but it was primarily from the earliest part of the series–and these editions have filled in the gaps that Rare Cuts had tried to fill. With this volume carrying to #96, I figure volumes 10 & 11 will be completely “new” content to my collection, with Son of Man picking up at #129. With several months between volumes, that won’t be something to worry about until next year sometime. What’s going to be particularly “interesting” to me is when (if?) these catch up to where I “joined in” around #160/161 or so; or just as much a few issues earlier with the start of Azzarello‘s run. Finally! 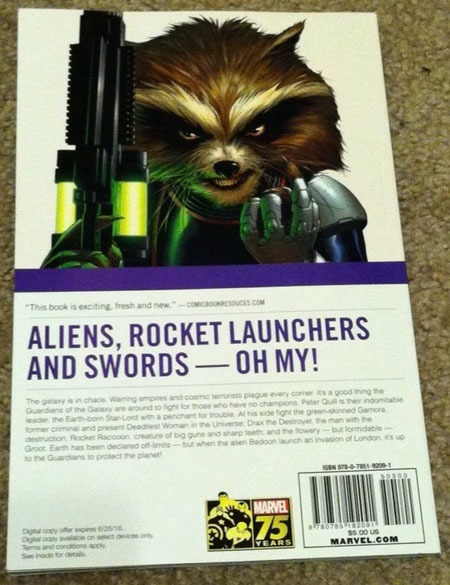 A Marvel Book Worth Its Cover Price! Most Marvel volumes are vastly over-priced and well beyond what I can actually bring myself to spend for a single unit. However, I found a promo-priced volume at Walmart that is VERY worthwhile. 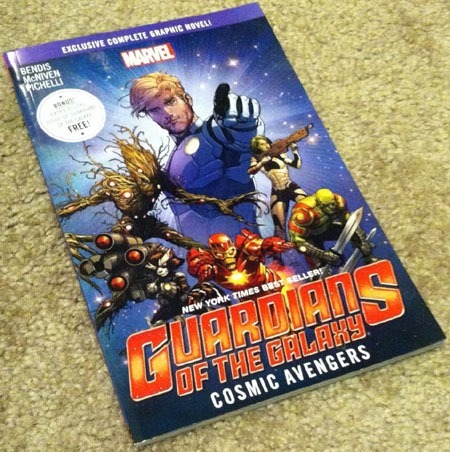 This is a full-sized Marvel volume (if flimsy in the cover-department) for a whopping $5.00 cover price. I mean…this has MORE THAN ONE ISSUE of content in it. It has a digital code on top of the several issues it reprints. It’s a square-bound volume. It’s not worth $19.99…but $5? Yeah, that beats the heck outta the usually bargain-priced $9.99 volumes that I consider more than worthwhile to “sample” a title. And so it is with this “Walmart Exclusive” that I found myself MORE THAN willing to spend cover price to buy the thing, and check out a title I wouldn’t otherwise. I believe there are 3 other $5 volumes Walmart is offering–a 7-issue Captain America: The Winter Soldier, Amazing Spider-Man: Big Time, and (Bendis‘) Avengers vol. 1. If I come across the Spidey one, I might spend the #5 for that story. The Avengers one I’m quite “iffy” toward, and I already have the Cap issues in my Ed Brubaker Omnibus, so no particular “sense” duplicating for now (unless these $5 volumes were to become an ongoing “thing” and I could amass a small “library” of such volumes). Definitely looking forward to reading this, after I catch up on some other reading. And who knows, maybe it’ll do something for me. Battle of the Atom and a Serenity "Upgrade"
Last year, I dropped All-New X-Men due to double-shipping and the $3.99 price point. 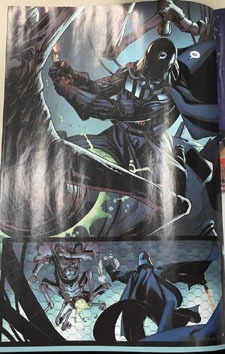 However, I was quite interested in this Battle of the Atom thing crossing through several of the X-books late last year. I very nearly bought the story in singles…but I held out for the hardcover. While I had figured–given other similar volumes–that the book would be at LEAST $29.99, if not $34.99 or a whopping $39.99. There are 10 issues in the volume, so even assuming the collected volume would cost “full single issues price,” I figured $39.99 would be the high end. Ridiculously enough, this rather skinny volume carries a MASSIVE $49.99 cover price! Fortunately, I got it for half-off; a “mere” $25. But at least it’s something I definitely want to read sooner than not…it’s not going to sit around waiting to be read like (too many) massively-DISCOUNTED volumes do. 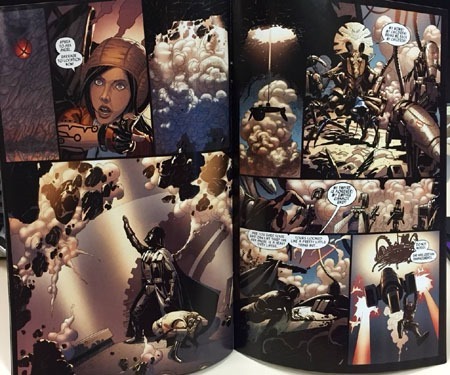 I also recently passed along my original edition Serenity graphic novels to a friend who was interested in the comics, knowing she’d enjoy them, and it provided me with a perfect “excuse” to upgrade to the hardcovers. Though I’d originally intended to snag the books back in December, I ended up holding off a few weeks before finally “pulling the trigger” and ordering them. As it worked out, ordering these alongside X-Men: Battle of the Atom, one way of looking at the pricing is that I either got the X-Men volume “free” by buying these, or got all three Serenity volumes “free” for buying the X-Men volume. 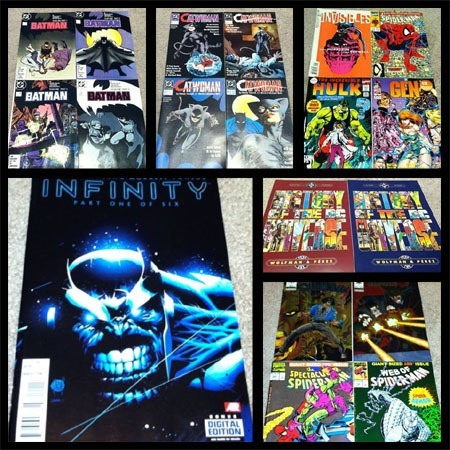 Infinity #1 has a $4.99 cover price, and includes 45 story pages–10 of those previously available (to customers, at least) “free” in the 2013 Free Comic Book Day Infinity issue. The day that I paid cover price for the issue, I also snagged a number of 25-cent bin issues. 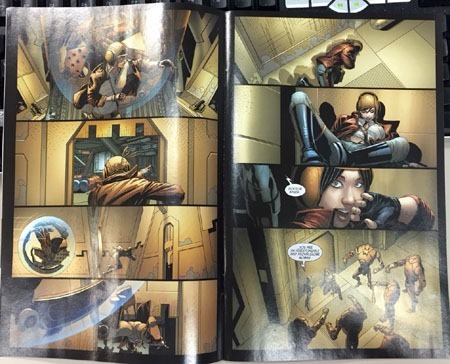 Which means that Infinity #1 was an especially poor value to issue quantity and page count! Yet another reason my enjoyment of older/’90s (and even ’80s!) comics is increasing while my enjoyment and interest in current comics continues to wane. This week’s Wednesday haul was a bit more normal-ish, except it included a couple of full-price back-issues I’d previously specifically avoided. Bloodshot #13 and Harbinger #14 I picked up as usual–they’re on my pull-list. The Eternal Warrior/Bloodshot Sketchbook was a freebie. As is fairly “usual” for me, I did do a quick rummage through the bargain bins at Kenmore. This week, the entire stack of bargain-bin comics matches the price of any of the four “regular” comics…which continues to be an increasingly disturbing thing! Found an X-Man issue on my list of missing-issues. A Hulk issue that just looks “fun” to read. And my two favorite issues of Fatal Attractions, and two of my all-time favorite issues, period…I just don’t pass up either of these issues when I find ’em for 25 cents…! Also found another X-Men issue I’m missing. 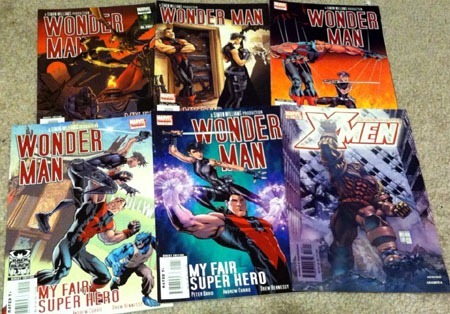 And keeping true, found the entire mini-series for Wonder Man here, so snagged it. 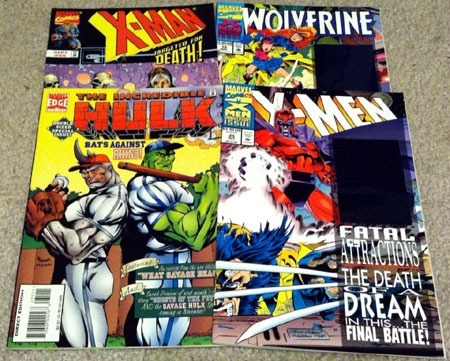 $1.25 for what in TPB would run at least $20-25 these days from Marvel…can’t beat that! About a quarter of one of the bargain bins seemed to be nothing but #1 (and #0) “premiere” issues from the ’90s. I don’t know if someone started to cherry-pick the bargain bins and put a stack back, or if it was part of an unsorted collection purchased and tossed in the bins. So I cherry-picked from those. 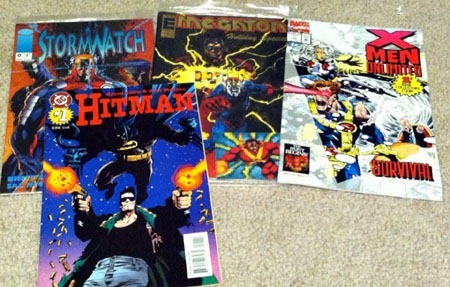 I grabbed the Stormwatch and Megaton issues because they’re bagged with a trading card. Figure maybe I can just horrify someone by opening the plastic to remove the card. Also a certain “novelty” to snagging Hitman #1 for 25 cents (last year having snagged his very first appearance for 50 cents). And X-Men Unlimited #1…that’ll just be a convenient opportunity for re-reading. I recognize one of the figures on the Megaton cover…looks like someone from an old Image series that had a flipbook with a Savage Dragon issue. I’ll need to look into that later. And finally, part of what I like (other than the stories themselves!) 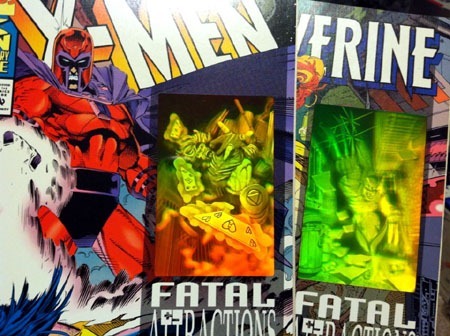 with the Fatal Attractions issues: the holograms! 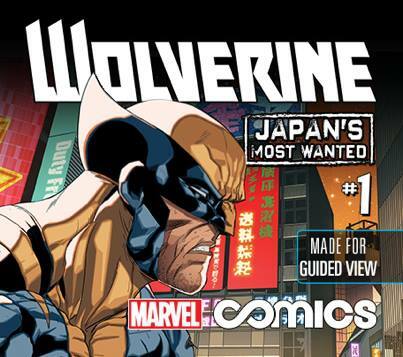 I saw on Comixology last week that the premiere “issue” of the weekly Wolverine “Infinite Comic” was now available–having read about its upcoming release awhile back. I naturally “assumed” it was 99 cents, but didn’t feel like even paying that much at the time. A few days later–newest non-rent paycheck in my bank account, I thought to splurge and go ahead and give it a try, drawn back by a guilty “interest” in Batman ’66 #2…but was dismayed to see the price as $2.99. 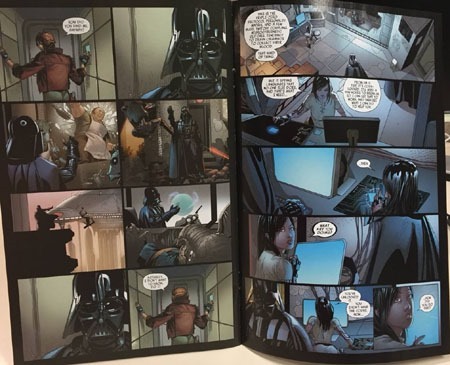 Granted, this thing’s listed as having about 79 “pages,” but as an “infinite comic” designed for the Guided View technology, that reads as “79 screens” to me–where the only difference in one “page” might be a word balloon or caption box, not an actual, unique story-page in the sense I think of for a comic, so that $2.99 might–for all I know–be the equivalent of a 10-12 page story in a standard print comic. So Marvel–and Comixology–lose out on my sale for this, given the price-point. Additionally, I’ve several times found myself halfway interested in a new-ish Marvel comic that I maybe passed on at the comic shop(s) or otherwise would be likely to impulse-buy digitally, just to read because I’m in the mood “at the moment.” However, the digital comics being the same as the print comics for $2.99 issues, I’d just as soon have the print edition to read. And for the $3.99 books…knowing that if I buy the print edition, I then–IN ADDITION for my same $3.99–also get access to a digital copy, I’m not ABOUT to spend $3.99 for a digital-only edition with no access to the print counterpart, so those “sales” are lost on me. DC–with their New 52–had dropped the price of the digital editions after a month (though sometime in the last year or so they bumped that two TWO months’ lag-time), whereas a look last night through some Marvel Now stuff (we’re what? 10 months into the Now age?) didn’t yield anything that I saw for under print editions’ cover pricing. I look forward to the Monday and Friday “sales” specifically for the chance to get digital comics (when they’re ones I’m actually interested in) for the 99-cent price point…but I am not willing to–as a matter of course–spend “full print-edition cover-price” for a digital comic.